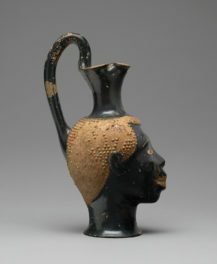 New for summer 2012—The Vexed Man is back at the Getty, but he’s moved from his usual haunts for the exhibition Messerschmidt and Modernity, July 24–October 13, 2012. The show brings together several of Messerschmidt’s Character Heads, including the excellently titled Just Rescued from Drowning and A Cheeky Nitpicky Mocker, and juxtaposes them with contemporary artists’ responses. Plus, you get to do this. One of the Museum’s most perplexing and beautiful objects, The Vexed Man, is away for a reunion of sorts. 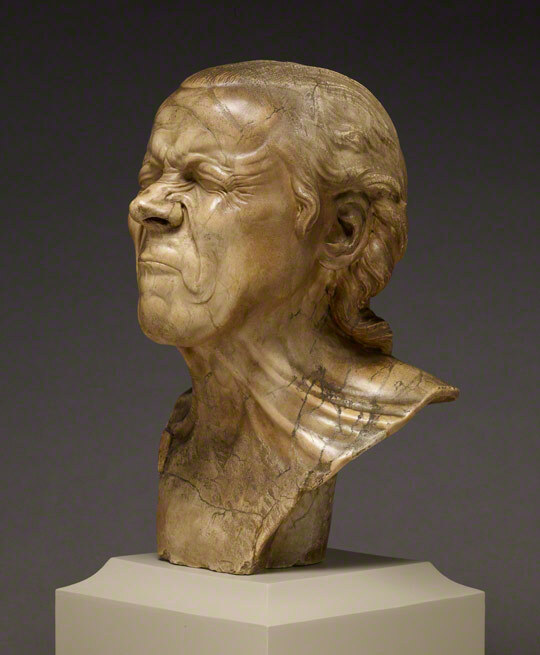 The alabaster bust by 18th-century sculptor Franz Xaver Messerschmidt has gone to join several of the artist’s other so-called “Character Heads” in an exhibition opening today at the Louvre in Paris, which was previously at the Neue Galerie in New York. The show explores Messerschmidt’s dramatic evolution from rising star of the Viennese art establishment to driven, and possibly mad, recluse. Passed over for the chairmanship of Vienna’s art academy in 1770, Messerschmidt sold all his possessions and withdrew to Pressburg (now Bratislava), where he spent the remaining 13 years of his life studying and sculpting exaggerated and often tormented facial expressions. Gazing into a mirror, Messerschmidt pinched and pulled at his body, attempting to cleanse himself of evil spirits that he imagined haunted him. But his madness—if madness it was—had method in it. 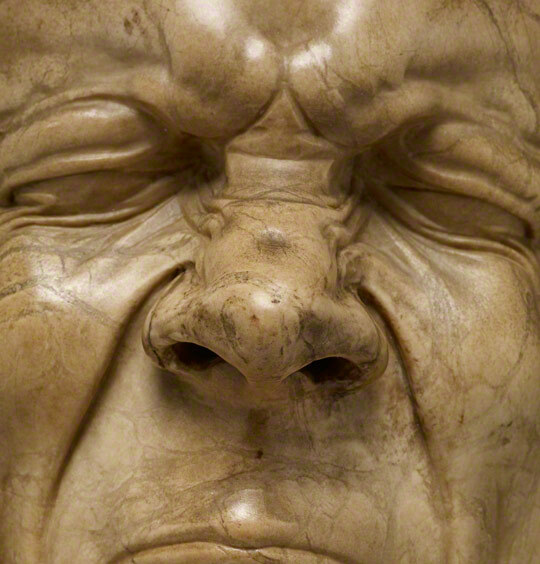 Messerschmidt’s Character Heads are more than self-portraits, more than studies of the emotions. They are one of the great artistic explorations of the Enlightenment, a meditation on the relationship between appearance and character. If a single face can be contorted into nearly infinite expressions, do our faces truly “carry the motto of our souls,” as claimed by then-fashionable physiognomist Johann Kaspar Lavater? Does the face make the man, or does the man make the face? Within a decade of Messerschmidt’s death at 47, his character heads were given the outlandish names they still go by today: Afflicted with Constipation, Just Rescued from Drowning, The Incapable Bassoonist (there’s no bassoon). 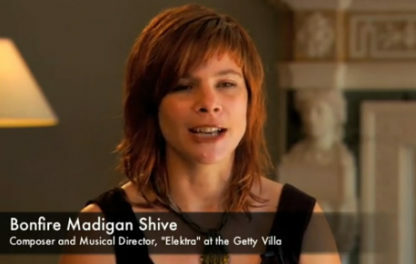 The names have stuck, a reflection of how hard it still is to characterize these works. How, for example, would you describe the expression in this bust in the Louvre? Does A Hypocrite and a Slanderer in the Met look to you to be either? Is our man vexed? If not, then what? 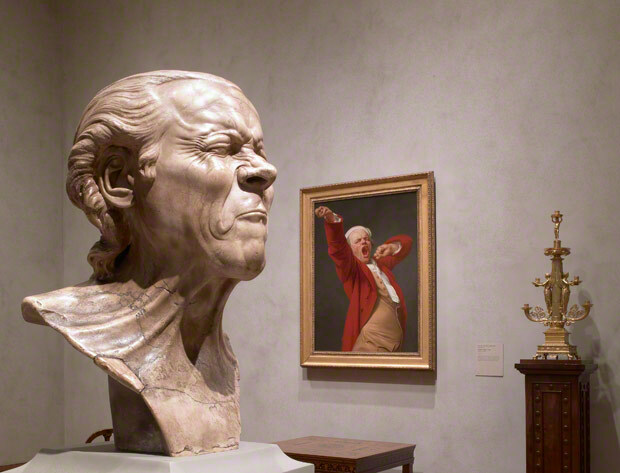 Come see our vexed Messerschmidt for yourself when it returns to the Getty Center in late spring. 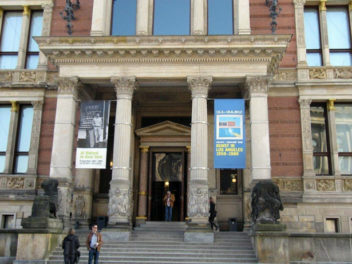 It will retake its place in the sculpture and decorative arts galleries in the West Pavilion. In the meantime, you can explore Messerschmidt’s character busts in the exhibition catalogue co-written by Antonia Boström, our senior curator of sculpture and decorative arts, or read photographer Ken Gonzales-Day’s physiognomic analysis of The Vexed Man and other busts in our latest Getty Research Journal. And yes, you can even fan Messerschmidt on Facebook.